from smallest to biggest he declared. big or small…enjoy it all! I love that…thanks for sharing both of those encounters. I would say those were such great examples of sowing and reaping a future harvest. I am so glad that God has placed you in a place where you can impact young minds and infuse them with hope. Thanks for being bold enough and impassioned enough to make a huge difference! 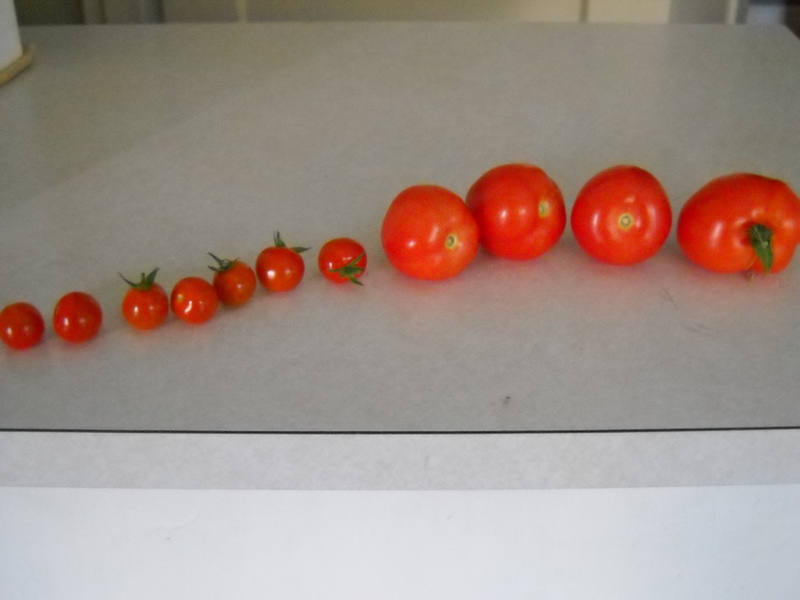 It always amazes me how children can do something as simple as arranging tomatoes and God can show us His awesomeness. Every day I believe He teaches me to appreciate the small things because after all…God has His hand in everything. I work in a school with about 470 kids and each one is so unique. I don’t believe in a “cookie cutter” approach to teaching and nurturing because they are all so different. Sometimes I am so exhausted at the end of the day and some days are so hard. I always wonder “What did I really do today?” Well, this week God answered that in 2 different incidences. I had a student about 3 yrs ago who was in a bad time of his life. He was always getting in trouble at school but for some reason I loved that boy. He was in a foster home and I just wanted to take him home with me. Yesterday I saw him for the first time in a couple of years. He looked so different and I really couldn’t put my finger on it. His face looked so cheerful and he was so happy. After talking to him he told me he was being adopted! I asked him about his parents and he said they were in their early 20’s. I am not sure why I said this to him but I said “You know that is why God put you here on earth. He put you here for that young couple and God was waiting for the right time to bring you together.” He said “I know. We are Christians and we have talked about that.” Of course, I got goose bumps and it brought tears to my eyes. I realized that the look on his face was God shining through him. The next one happened a year after I had a discussion with one of my groups. We were talking about people being bullies and insulting us. I said the best way to get at someone is to say “I will take that as a compliment!” I told them it will make that other person mad. Yesterday, one of my kids said “Mrs. Corbett. Remember what you told us about people saying mean things to you? You were right. Someone said something mean to me and I said I would take it as a compliment. It made them really mad. I am glad you told me that.” What I learned is you never know when they are listening so be careful what you say.